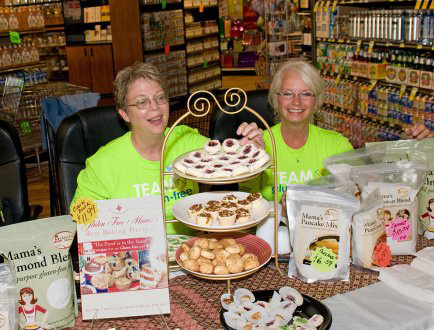 Lori McElhaney and Jeanne Dickson are seen at Yoke’s Nature’s Corner Gluten Free Demo Day Event. The North Idaho/Eastern Washington Chapter of the Celiac Disease Foundation is a nonprofit organization with more than 280 registered members. Members are encouraged to join the National Celiac Disease Foundation but are not required for membership. • Holiday Pot Luck, 1 p.m., Saturday, Redeemer Lutheran Church, 3606 S. Schafer Road, Spokane Valley. People are invited to bring a favorite gluten-free dish, and copies of the recipe to share. A $3 donation is accepted to cover the cost of the building. • Rachel Carlyle, the “Gluten-free Mama,” will offer two gluten-free product demonstrations. On Nov. 19, Carlyle will show how to make sesame french bread, 6 p.m., at Pilgrim’s Market in Coeur d’Alene. On Nov. 20, at 11 a.m. Carlyle will hold demonstrations at at Yoke’s in Mead. Once considered a rare condition, current statistics show celiac disease affects one in every 133 people in the United States. As diagnoses for celiac disease – or having a gluten intolerance – increase, those affected locally can find support and resources from the North Idaho/Eastern Washington Chapter of the Celiac Disease Foundation. Prior to her diagnosis, member Bonnie Boudreau, 67, battled an intense rash for more than 18 months. The rash started on her abdomen and eventually covered her entire body. Cortisone shots periodically would relieve the symptoms, but the rash never went away. When Boudreau reached her breaking point and told her doctor they had to do something, it took extensive blood work to reveal the disease. After reading about the group in the paper, Boudreau attended her first meeting in May 2008. The Spokane chapter, originally known as the Inland Northwest Celiac Explorers, began in 1996. The small group of seven met every four months in founder Melba Tschirley’s living room. Tschirley formed the group as a result of her diagnosis. Her goal was to fill the knowledge gap, and educate herself and others about the disease. Independent of the Spokane group, Jeanne Dickson formed the North Idaho group in 2001. Her group originated as a connection group. They began holding meetings in November 2004. As a means to share resources, the two groups combined in 2006. In 2007, the group became an official chapter of the National Celiac Foundation and received nonprofit status. The group meets monthly at various locations throughout the area. The informal meetings give members a chance to become advocates for their own health by socializing, asking questions and gathering information about celiac disease. The group also works on educating the public by setting up a booth once a month at various locations. Wearing fluorescent green “Team gluten-free” T-shirts, members offer a gluten-free demonstration day. Dickson also created a library of more than 45 books for members. Members end each meeting by sharing recipes and gluten-free goodies. Celiac disease is the immune-mediated response to ingestion of gluten from wheat, rye and barley that damages the small intestine. The result of the damage is that nutrients pass through the body quickly rather than being absorbed. Symptoms are common to other conditions and can appear at any time during a person’s life. It is often overlooked or misdiagnosed. The National Celiac Disease Foundation website reports that “symptoms vary and are not always gastrointestinal.” Those with celiac disease can experience diarrhea, bloating, weight loss, anemia, bone or joint pain, chronic fatigue, depression, dental enamel defects, brain fog and nerve problems that range in severity.